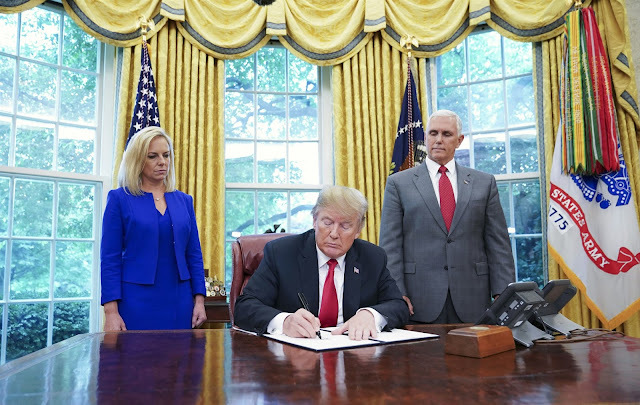 President Donald Trump, under pressure from angry members of his own party, signed on Wednesday an executive order that is meant to keep families together at the border, halting a policy he instituted earlier this year. "It's about keeping families together while ensuring we have a powerful border," Trump said of the order. Trump said the order "will solve that problem" of children being separated from their parents, but that it wouldn't end his administration's "zero tolerance" policy of charging everyone who attempts to cross the U.S.-Mexico border illegally, a decision that led to the current crisis. "I didn’t like sight of families being separated," Trump said. Earlier in the day, Trump had said he'd "be doing something that's somewhat pre-emptive and ultimately will be matched by legislation I’m sure," after he was asked if he wanted to try to keep to families together at the U.S. border. Trump did not disclose exactly what he would be signing, but an administration official confirmed to NBC News that an executive order had been drafted by the departments of Justice and Homeland Security to temporarily stop separating children from the parents of people detained at the border. Government officials familiar with early drafts of the executive order also told NBC News it would allow families to be detained together but would not stop the "zero tolerance" policy of charging people with a misdemeanor for entering illegally. Several administration officials say the executive order would allow families to be held in immigration detention together. That will run up against a longstanding federal court decree that prohibits the government from holding children in detention for long periods — generally around 20 days. The order will also move up hearings for families in detention, putting them at the head of the line, to speed up that processing, officials said. It remains unclear how the government will get around the immediate separations that occur when the parents are charged with a crime and taken to court for entering illegally. But officials say they believe they have found a way to continue those charges without separating the children. The president, nonetheless, doubled down on his hard-line stance on immigration, saying that he "like to be strong" and that migrants were "using the children as a ticket to get into" the U.S.
Trump also announced that he'd canceled a congressional picnic that had been scheduled for Thursday, saying the timing "just didn't feel right." Trump's announcement contradict comments he made last week — he said Friday that when it came to keeping migrant families together, "you can't do it through executive order" — but follow intense and growing backlash to his administration's policy of separating children from parents who cross the U.S.-Mexico border illegally. Many Republicans have demanded an end to the policy, and bills are under consideration in Congress that would halt it. Pressure grew Tuesday night after The Associated Press reported that Trump administration officials have been sending babies and other young children forcibly separated from their parents at the U.S.-Mexico border to at least three "tender age" shelters in South Texas. First lady Melania Trump has also been a factor, a source familiar with the matter told NBC News. According the source, Mrs. Trump has been having private discussions behind the scenes in order to try to end the separation of kids and families at the border. Earlier this week, she uncharacteristically waded into the immigration debate, pushing for bipartisan cooperation to end the separation of migrant children from their parents at the border. The House is set to vote Thursday on two immigration bills: a more conservative bill authored by Rep. Bob Goodlatte, R-Va., chairman of the House Judiciary Committee, and a compromise immigration bill. Following Trump's remarks, roughly two dozen House Republicans headed to the White House to discuss the measures. Get a Brand New Apple Watch!